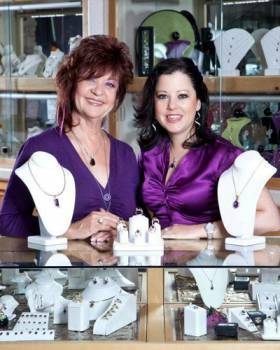 Mother-daughter duo: Sami Jack and Stephanie Bjorkman of Sami FineJewelry in Fountain Hills, Arizona. With more than 40 years of expertise in jewelry design, Sami has been creating the finest pieces since 1980. Conceptualizing an unorthodox approach to engaging consumers, Sami and Stephanie’s method of introducing Arizona Amethyst takes place in a helicopter and tours the local mines from April to October. Working alongside her mother since 1997, Stephanie has played as a second eye to the design process. Attracting the discriminating eye of jewelry buyers around the country, Sami’s Fine Jewelry serves as the most sought-after pieces. Sami Fine Jewelry, named one of America’s Top 5 Cool Jewelry stores by InStore Magazine, is coined as a pampering destination for Arizona amethyst and glittering entertainment events. Together, Sami and Stephanie can share a wealth of knowledge in several topics such as leading business women, family business ventures and consumer’s general interest in luxury goods. Sami Fine Jewelry boasts a wide range of unique jewelry, large diamonds and exotic gems along with carrying Hearts on Fire, the world’s most perfectly cut diamond. Learn about more jewelery designers at the Jewelry Network website. This entry was posted in Jewelry and tagged fine jewelry, jewelry store, Sami, Sami's. Bookmark the permalink.